As discussed previously, the state of Washington is experience a relatively large outbreak of whooping cough (Bordetella pertussis), with 1,132 cases of whooping cough so far in 2012, which the state reports as over 10 times higher than what was reported in 2011. The epidemic has caused the hospitalization of 20 children under the age of one. Washington Governor Christine Gregoire released cash from an emergency fund last week to be spent on efforts to contain the epidemic. Gregoire has made $90,000 available to strengthen the public awareness campaign about the need to vaccinate against the highly infectious disease that is also known as pertussis. The state’s Department of Health projects that it will spend approximately $200,000 on the campaign. The state has also sought and received approval to use federal funds to purchase 27,000 doses of pertussis vaccines that will be available for the uninsured. Senator Maria Cantwell, Washington’s Democratic Senator, has requested assistance from the Centers for Disease Control (CDC) to send epidemiologists and other researchers to the state to investigate and help battle the epidemic. Though no there is no confirming information, lower rates of vaccination might be the cause. According to Mary Selecky, Washington state’s Secretary of Health, said “pertussis is very serious, especially for babies.” “It’s vital that teens and adults are current on their immunizations because they’re often the ones who give whooping cough to babies.” Many adults were vaccinated when younger, but the immunity lapses after about 10 years. Unvaccinated adults and children pass the infection to non-immunized babies (because babies cannot be vaccinated until about 2 months). Pertussis is serious respiratory illness spread by droplets from coughing or sneezing. The prognosis for adults can be serious enough (broken ribs from coughing is one of them), but for children, it can mean death as what happened recently in Idaho. Again, there is just no reason to refuse to have children vaccinated. 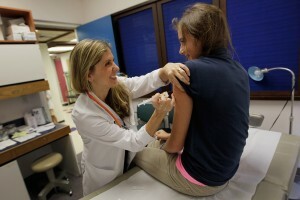 via Wash. opens up emergency money to stop whooping cough epidemic | Vaccine News Daily.